Halloween is right around the corner and Thanksgiving (my favorite holiday) is soon to follow, so it gives me a chance to share my obsession with "Pumpkin"! For the next month or so I will be posting all my favorite pumpkin recipes and ideas, everything from pumpkin pie to pumpkin centerpieces. In a large bowl, combine cream cheese, sugar and vanilla. Beat until smooth. Blend in eggs one at a time, then add pumpkin, cinnamon, cloves and nutmeg, stir gently until well blended. Place pie crust/crusts on a baking sheet, carefully spread batter over the crust. You can substitute the cinnamon, cloves and nutmeg with 1 teaspoon pumpkin pie spice. If making the 12 mini crusts reduce cooking time by 5-10 minutes. 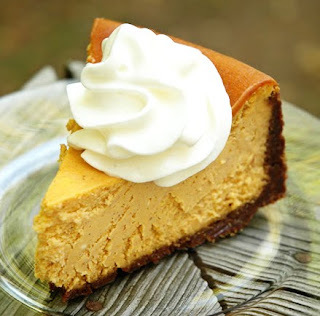 Prevent cracks by baking the pie at a moderate temperature and even better, bake custard pies in a “water bath”. This prevents the outer layer of custard from baking too fast. But if it does crack, just remember you can cover it with whip cream!